Choose the Playlist category in the Play Music app. Touch the Menu icon button in the upper-right corner of the screen. Type a name for your playlist. Short and descriptive names are best. Touch the OK button to create the playlist. The new playlist is created and placed onto the Playlists screen. Hunt down the song you want to add to a playlist. You don’t need to play the song. Simply display the song in the Play Music app. Likewise, you can hunt down albums, artists, or even genres. The technique described in this set of steps works for every category in the Play Music app. Touch the menu triangle by the song (or album or artist). Choose the Add to Playlist command. The song (or album or artist) is added to the playlist’s repertoire of music. Repeat this set of steps to continue adding songs to playlists. You can have as many playlists as you like on the Nexus 7 and stick as many songs as you like into them. Adding songs to a play-list doesn’t noticeably affect the tablet’s storage capacity. 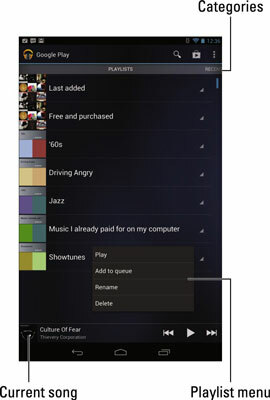 To remove a song from a playlist, open the playlist and touch the menu triangle by the song. Choose the Remove from Playlist command. Removing a song from a playlist doesn’t delete the song from the Nexus 7’s music library. Songs in a playlist can be rearranged: While viewing the play-list, use the tab on the far left end of a song title to drag that song up or down in the list. To delete a playlist, touch the menu triangle in the playlist icon’s lower-right corner. Choose the Delete command. Touch OK to confirm. Any playlists that you’ve already created, or that have been preset on the tablet, appear in the Playlists category, which you can choose by swiping the categories list all the way to the left in the Play Music app. Playlists you’ve created are displayed on the screen. A playlist is a helpful way to organize music when a song’s information may not have been completely imported into the Nexus 7. A quick way to remedy unknown music files is to name a play-list after the artist and then add those unknown songs to the play-list.